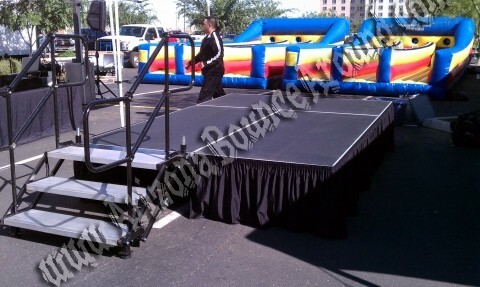 Stage rentals come in 3 different heights to fit most any needs. Not all stage rental companies rent high quality stages but rest assured our stages are. We rent Stages in Denver, Colorado Springs, Aurora, Fort Collins, Lakewood, Thornton, Arvada and Centennial CO. Stage rentals delivered and set up at your event in Colorado. You need to know 3 basic measurements when renting a stage: Length, Width, and Height. We rent different types of stages and risers to fit almost any need and we'll be happy to answer any questions you have about stage rentals. Our stage panels are 4 feet wide X 8 feet long so we can make many different configurations with our portable stages. Some common stage sizes are listed below. Each stage panel rents for $45 and will include you choice of 12" or 24" tall stage height with black skirting all the way around. Stairs with hand rails for 12" or 24" stage can be added for $49 and not really needed for 12" stages but can be added if you desire. Set up and take down is included for flat level ground. Delivery and pick up is additional and will vary on the size stage you rent along with many other factors so please call us with your details and we will be happy to give you a written or verbal quote. 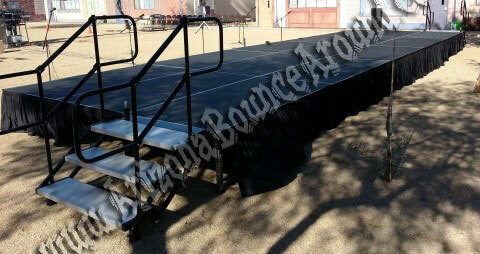 Please scroll down for more photos of our portable stages. 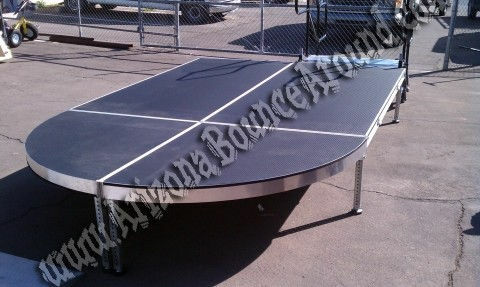 Our stage panels have a rubberized non slip coating bonded on the top surface that looks great. Most other stage rentals are covered with black Astro turf or carpet. Our stage rentals are professionally made to be used as a stage and are not tables with short legs clamped together. Our stairs come complete with handrails at no additional charge. Our stage rentals are professional quality and feature wide stairs with hand rails so they are very easy to climb. We finish all of our stages with black stage skirting for the professional look you deserve. We offer round corners for fashion runways or as an extension to any stage. 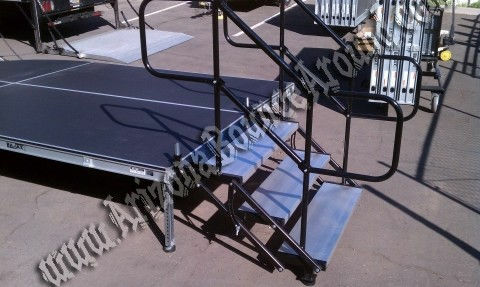 Our stage stairs have a steel frame with aluminum steps making them easy to see while climbing. Not all stage rental companies carry this type of stage but rest assured that when you rent stages from Gravity Play Events you will get high quality stage panels delivered.